When people talk about exotic music, or whatever you call instrumental music with an exotic touch, they often only think of records made in the States. Okay, most of the Exotica comes indeed from America, but there is a lot of good stuff made in countries that an average American probably don’t even know to exist. A band that is rarely mentioned in articles on Exotica, is the Belgium band The Waikikis. They made a handful of LP’s in the 60’s, of which certainly the first two are worth putting on your want list. 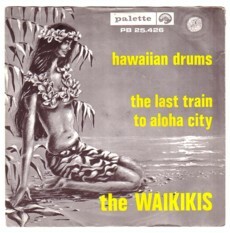 As you might have guessed by their name, they operate in the Hawaiian genre, which was very popular in Holland and Belgium in the late 50’s and early 60’s. Hawaiiana is the no budget Lowlands version of the American Tiki culture, if you can still follow me here. Lucky for me my parents had a Waikikis record, so I knew a bit earlier than the rest of my colleagues that this is worth going after. It may have helped that on the cover of the record that my parents owned is a half naked lady. It might very well be that if they owned the record with this misformed female alien, I would never have written this story. And then you would also have missed this music!